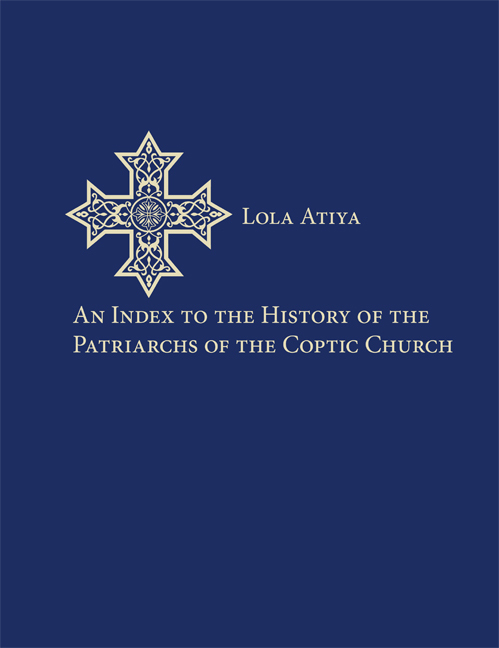 The History of the Patriarchs of the Coptic Church is an extensive work, originally written in Arabic, and translated, edited, and published in English between 1904 and 1974. The history covers the genealogy of Christ, the martyrdom of Saint Mark, and the life of Cyril V, the 112th patriarch of the Coptic Church, among other topics. Lola Atiya prelpared an exclusive index to the History. This five-sectioned index provides names of persons and groups, locations in Egypt, a complete list of churches, convents, monasteries, mosques, and synagogues mentioned in the text. A brief glance might suggest that The History of the Patriarchs of the Coptic Church is simply an ecclesiastical history. Rather, this important volume stands apart as an important record of twenty centuries of historical, social, and economic factors affecting Egypt and the greater Middle East. This comprehensive index makes that important work accessible to scholars and students. The late Lola Atiya was wife of the Dr. Aziz Atiya, founder of the University of Utah's Middle East Center and a prominent world scholar of early Christianity.